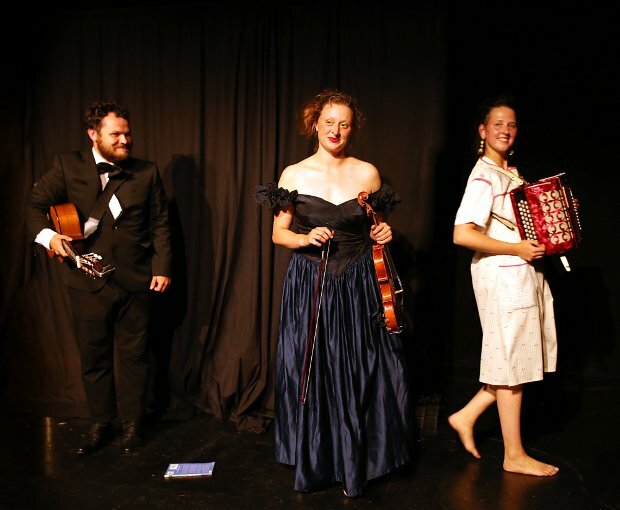 Lobster Quadrille's Carabet is an hour of absurd theatre from the Philippe Gaulier-trained trio that (as you'd expect) is low on traditional jokes and punchlines, but is gripping and disarmingly funny nonetheless. The universe that Carabet operates in is an unsettling one: compliments are taken as a threat, waiters don't acknowledge your ghostly presence, and a walk in the park contains a few surreal Blue Jam-esque twists. In the innovation stakes (and with its creators showing a similar penchant for wonderfully bizarre costumes), Carabet calls to mind the world created by superb double act Beard, last spotted here in 2015. The trio, made up of Firdaws Fourcroy, Paulina Lenoir and Alasdair Saksena, have crafted an hour that's almost always amusing, and occasionally strikes gold. They're magnificent physical comedians, but what really sets Carabet apart is the soundtrack which lends it a cinematic flow. Saksena's renditions of 'Blue Moon' and Peter Sarstedt's 'Where Do You Go to My Lovely?' are genuinely tender and impressive, with Fourcroy and Lenoir harmonising to great effect, while the whole show is backed by a soundscape of flamenco guitar, creepy piano interludes and slices of operatic singing. Those prepared to take leave of reality and get lost for one hour should look no further. Laughing Horse at The Newsroom, until 27 Aug, noon, free. This show is a joy. I have seen it twice. The performers are so inventive and deliver a wonderful collection of sketches. It is absurd comedy at its best. Absolutely brilliant, very talented, ingenious, artful, so so funny, their facial expression the best.The only word I can think of to describe them is... AMAZING!! !